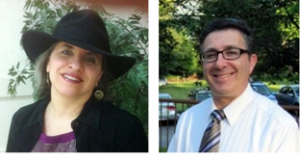 In recognition of their volunteer leadership in various aspects of Tikvat Israel’s life, Sally Kram and Rodney Matheson will be honored as the 5779 Kallat Bereshit and Chattan Torah on Simchat Torah. Literally “the bride of the beginning” and “groom of the Torah,” the Kallat Bereshit and Chattan Torah awards are presented each year to two deserving Tikvat Israel congregants or staff members who have made significant contributions to the synagogue’s spiritual, educational and/or cultural life. Brief profiles of both award winners can be read in the Bulletin on page 4.